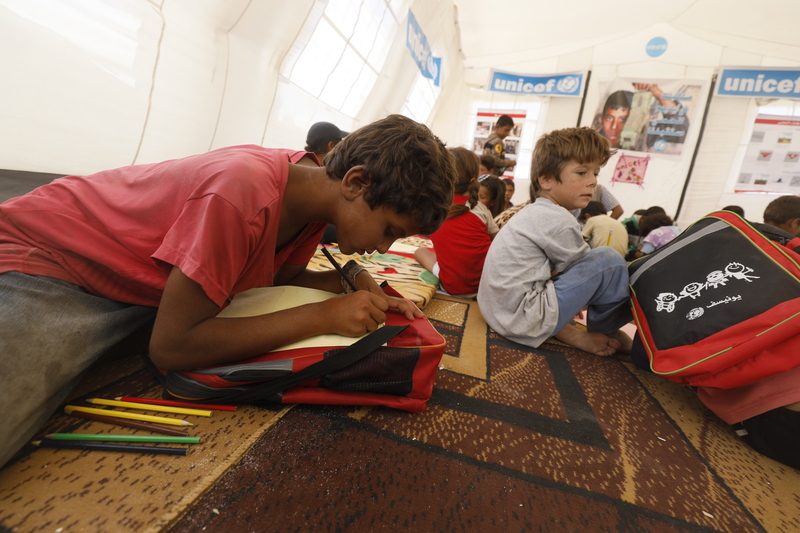 Ibrahim during a drawing session at the UNICEF-supported child friendly space in Ein Issa. Syria, Ar-Raqqa, 30 October 2017 – For years, the fighting, attacks and restrictions imposed on education in Ar-Raqqa forced children to attend school only sporadically. Many, like Reem, have never seen the inside of a classroom. Together with her family, Reem, 10, was forced to flee the violence around her home in Ar-Raqqa and seek shelter at Ein Issa, a tented camp in the middle of the desert. “When I used to hear the sounds of fighting, I’d run to my mother’s lap,” says Reem, remembering the horrific days she lived through. “We left our home at night, I could barely see anything because I was crying the whole time,” adds Reem who had to walk through dangerous roads lined with landmines to reach safety. This school year, Reem and 2,200 other children living in the camp, received school bags and stationery distributed by UNICEF. “I’ve only ever seen a school from the outside, this is the first time I even own a school bag!” she says cheerfully. 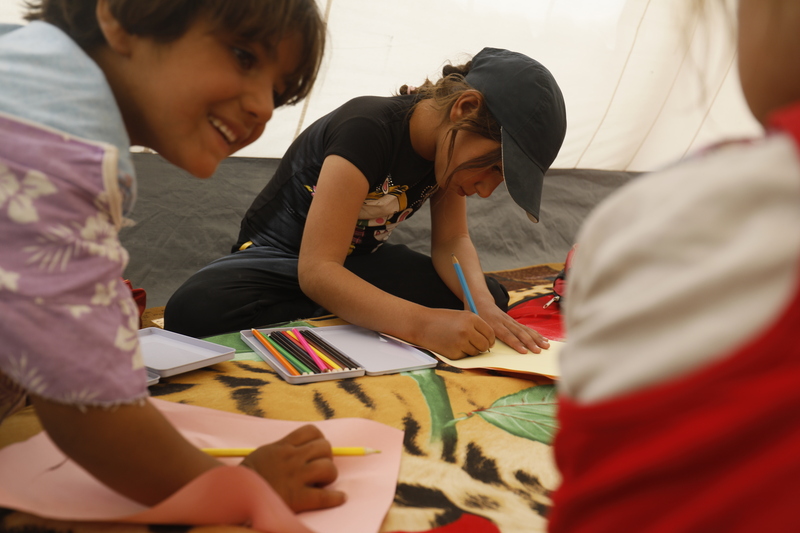 Reem (in a cap) during a drawing session at the UNICEF-supported child friendly space in Ein Issa. Reem dreams of becoming a teacher one day, to make sure no child is left without education. Reem’s 10-year old friend Ibrahim, has memories of his old school back in Ar-Raqqa. Ibrahim and his family were also forced to flee their home in rural Ar-Raqqa and seek shelter at Ein Issa camp. “I used to walk around an hour to reach school every day,” says Ibrahim who was forced out of school in Grade 1. “I loved school, I’d walk under the rain, through muddy streets. I used to feel the cold wind hitting my face,” he adds. Ibrahim dreams of becoming an architect when he grows up. “I want to rebuild houses for everyone in Ar-Raqqa”, he adds with hope. At Ein Issa camp, UNICEF supports six tents serving as child friendly spaces, where children like Reem and Ibrahim receive psychosocial support. They engage in recreational and educational activities designed to help them better cope with their reality. UNICEF is also setting up 10 tents as temporary learning centres, to help children at the camp continue their education.